Find My iPhone is a useful feature in iOS 12 and earlier that helps you find your device, lock it, or erase it if it is lost or stolen. Disabling Find My iPhone is required when you want to reset your device. You can disable it easily via the iCloud section of the Settings app if you know your iCloud password. But if you don't have the password, then bypass it could be a challenge. How to Bypass Find My iPhone in iOS 12/11/10/9/8/7? Bonus: How to Permanently Erase Everything from iPhone? Step 2. Enter your Apple ID and then click on Continue. Step 3. Now you will see two options on the next screen i.e. Get an email or Answer security questions. Choose get an email option and then click on Continue. Step 4. 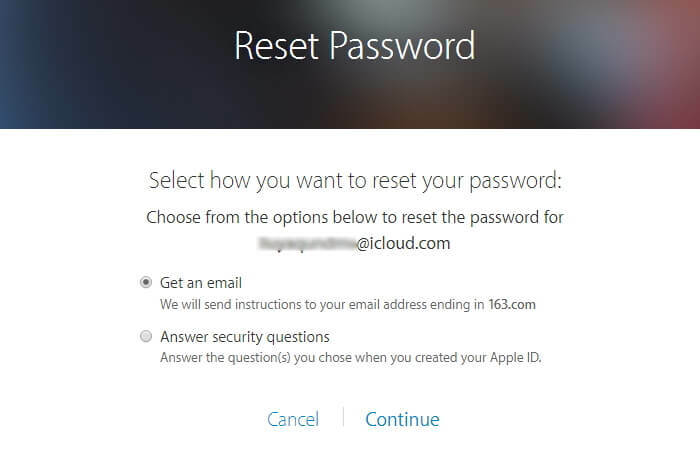 After that, you can find a link to reset the iCloud password in your email.. Step 1. 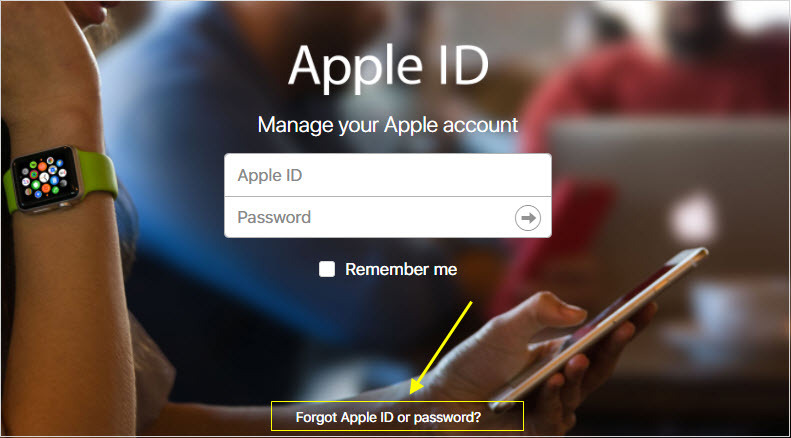 Contact the previous owner and ask them to sign in to iCloud.com with their Apple ID. Step 2. 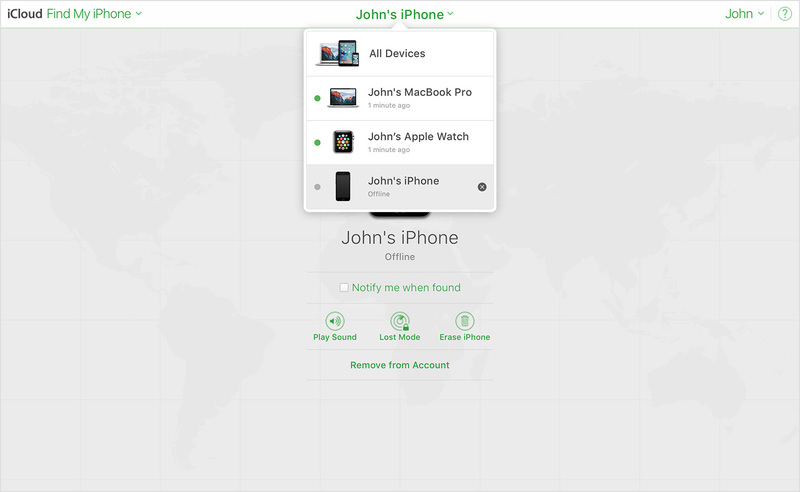 Navigate to Find My iPhone > All Devices and select your device from the list. Step 3. Now click Remove from Account option to remove your iPhone from their account. Removing the iPhone from their account will automatically disable Find My iPhone feature on your device. If your iDevice is running iOS 8 or 9, then you can use a foreign DNS server to bypass Find My iPhone pretty easily. The process to do this is quite straightforward. Navigate to 'WIFI' and tap on the information icon in that section to open the DNS server. Now input 104.155.28.90 if you are in USA or input 104.155.28.90 if you are in Europe. Tap the back arrow and then tap Done option to complete the action. Now proceed to disable Find My iPhone via the standard method. 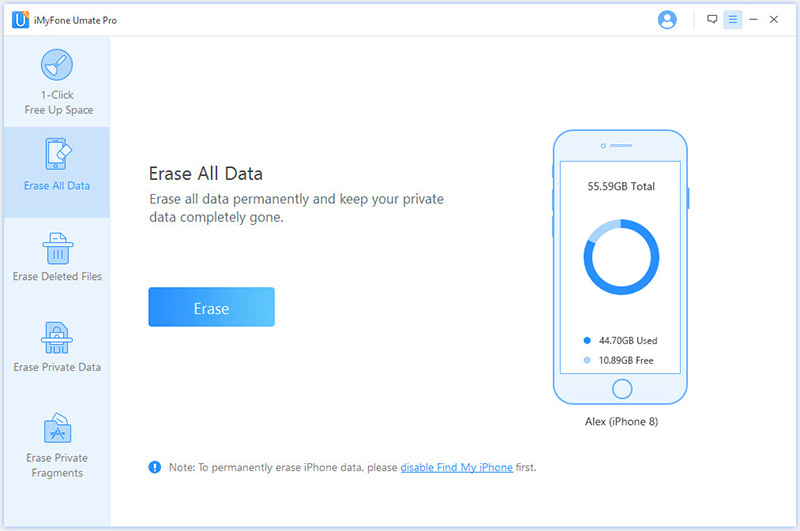 Want to sell your old iPhone and keep your private data safe? Most of people choose to make a factory reset, however, this is not enough for privacy safe. There are still some fragments left on your device, these fragments may be your password, call history etc which can be recovered easily with recovery software. So, is there a way to permanently erase everything from iPhone? Here recommend iMyFone Umate Pro. Completely reset iPhone by wiping everything from it permanently without leaving any traces of data. Erase your private data selectively. You can preview your private data before permanently erasing it. Scan previously deleted files on your iPhone and erase them permanently to make them 100% unrecoverable. Permanently erase third-party app fragments and traces and free up space. Boost your iPhone's performance via 1-Click Free Up Space mode. What is the Difference Between Normal Factory Reset and Erase All Data? The primary difference between normal factory reset and erasing all data via iMyFone Umate Pro is the permanent deletion. 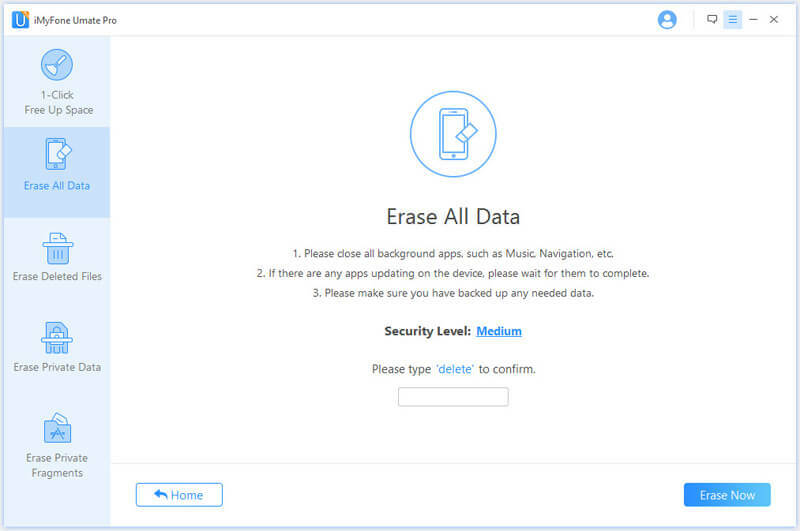 iMyFone Umate Pro erases data permanently so there won't be any risks of privacy leak. Resetting your iPhone via normal factory reset method is not safe because the data is not deleted permanently and could be easily recovered via a data recovery software. iMyFone Umate Pro erases your selected data and then writes new data in its place by overwriting with random files. Once all the free space is occupied, the software then erases the newly stored data and then writes a new data in its place. It repeats this process many times until the data intentionally erased at the beginning becomes 100% unrecoverable. Thanks to the advanced data removing and writing algorithm, data erased via iMyFone Umate Pro is permanent and no data recovery software can recover it. Step 1. Connet your iPhone to computer and launch iMyFone Umate Pro. Step 2. Select Erase All Data mode and click on Erase. Step 3. Manually type 'delete' and click Erase Now button to permanently erase all data from your iPhone.